Shaving cream has never been at the top of my list of must-buy toiletries. I usually just shave my legs with straight soap and water because it’s fast, easy and super cheap. 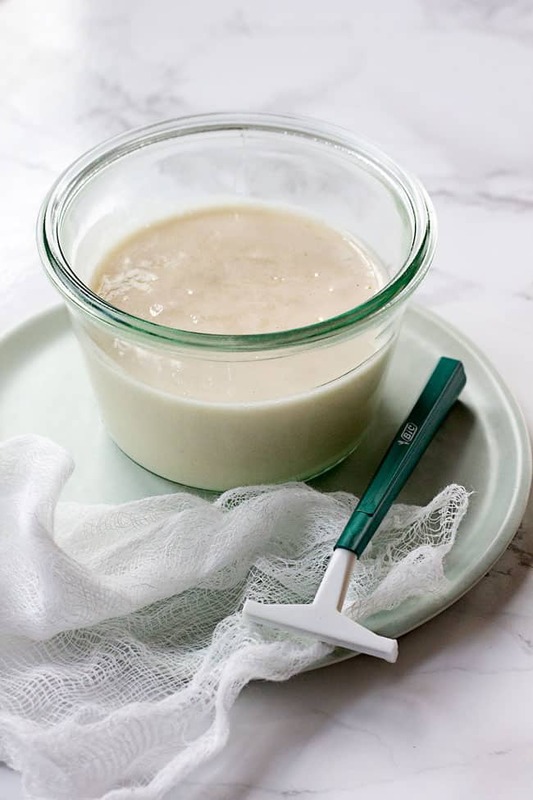 But I have always battled those pesky ingrown hairs and razor bumps that come with a quick, soapy shave. And especially in the winter when my skin is already parched to begin with, drying it out even more with harsh suds and piping hot water isn’t doing me any favors. But recently I ditched my bar soap and started making this creamy, nourishing shaving cream instead. Trust me when I say it’s so rich and moisturizing you may never want to use anything else again. I love this homemade shaving cream because it is the best of both worlds. It contains non-drying castile soap so it suds up like a bar soap, but it also has a mixture of rich ingredients that soothe and nourish the skin. 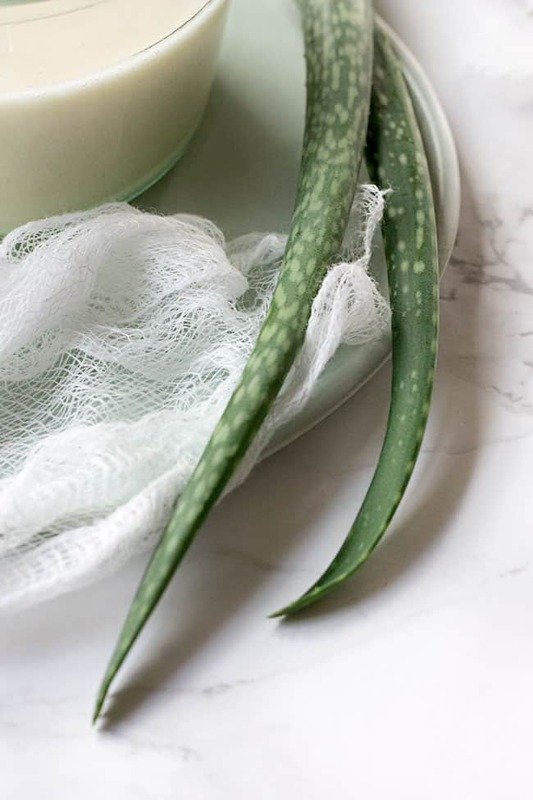 Add in a few drops of tea tree oil to help prevent bacteria from infecting the follicle and lavender oil to calm irritated skin. And last but not least, a good helping of coconut oil leaves you with perfectly soft, flake-free legs. But the real secret ingredient in this shave cream is the aloe vera. 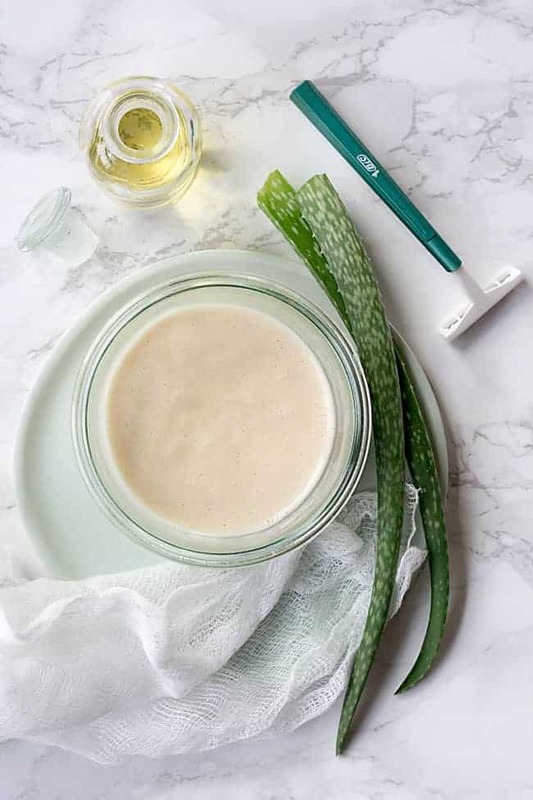 Aloe has long been used to treat everything from wounds and burns to skin infections and psoriasis, and when applied to freshly shaved legs it helps keep them bump and burn-free. To get the best shave possible, apply the shaving cream 5 minutes before you start shaving and let it soak in. It will help soften the hair follicle and nourish the skin so you don’t have as much irritation. And don’t forget to replace your razor as often as possible. A sharp blade allows you to get a close shave without the nicks and scratches. Not only that, but a fresh blade doesn’t contain as much bacteria, thus preventing painful bumps, rashes, and infected follicles. Your shaving cream should keep at room temperature for up to a month. If you’re worried about it going bad before you have had a chance to use it, try making smaller batches or storing it in the refrigerator in between uses. Is there an alternative oil that I can use instead of the honey? I should really try this. Like you, I’ve never used shaving cream before!